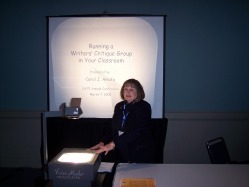 I presented "Running a Writers' Critique Group in Your Classroom" to high-school teachers. No PowerPoint projectors were available, so I had to go low-tech with old-fashioned transparencies! I presented "Running a Writers' Critique Group in Your Classroom" to elementary and high-school teachers. 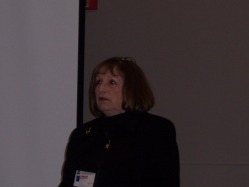 Fellow writer Cheryl Block and I exhibited at this conference. 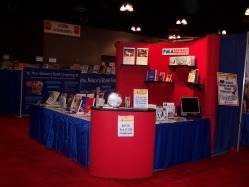 Here's our booth.